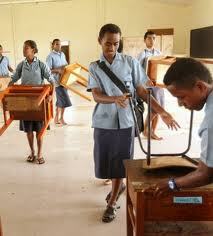 Major changes are expected to be announced in the Primary and Secondary school Education systems and curriculum. The Education Minister, Filipe Bole has told Legend FM news that the Government will fund education for every child from next year. Legend FM also reports that the major change which will come into effect next year will see the introduction of a 13 year Education system from year 1 to year 13. This will mean that from next year we no longer will say class one, as it will be known as year one and so forth for other years of study.Primary school will include year one to eight while Secondary school will have year nine to thirteen. The Education Minister has stated that year nine to 11 are preparation years for external examinations taken in years 12 and 13. He said the curriculum contents of some subjects have also been changed to include relevant and job related contents. This include syllabus for Year one to Year four which will mainly focus on numeracy and literacy. In addition to this, curriculum contents for subjects in Year 11 which include Economics, History and Physics, will also change.